I've been taking an art class on nests and nestmaking. As to be expected, we covered a fair amount of Patrick Dougherty's work. These sculptures are are incredibly impressive and inspiring to me. I want to go live in one. 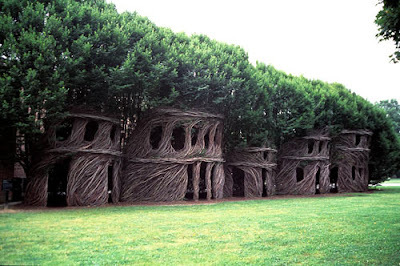 My biggest question is: Where does he get all the willow branches to make his sculptures? I presume they aren't all willow, but with so much material going into these structures, it must take a small logistic miracle every time one goes up. I think that one of the things I like best about his work is that it photographs so well. The image in this post make it look like those giant tree-sized structures are almost miniature. I wonder if any of the beauty would be lost in real life. I doubt it, but I could potentially see how a rough structure would be less impressive close up.